Brooklyn bar offers a cozy spot from which to catch all the action. 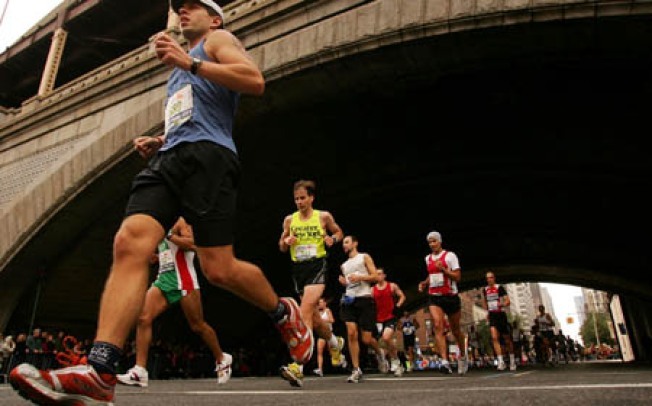 Watch the 2008 New York City Marathon from the comfort of a neighborhood bar. If you've been training to run in the annual New York City Marathon tomorrow - we're talking to you, Posh -- good for you! Run a few of those 26 miles for us, will you? Great. In return, we'll promise to drag ourselves out of bed and be among the two million spectators of the big event - specifically, we're planning to watch history from one of Brooklyn's coziest bars: Pacific Standard is opening exceptionally at 9:30AM tomorrow, to give its patrons a plum view of the marathoners running right along Atlantic Avenue outside. They'll also be installing a "barbecue station" on the sidewalk, "so you can grab some cheap hot dogs and burgers, or bring meat/veggies of your own to grill." Beer and burgers before 10AM. Now doesn't that beat running 26 miles and getting one of those little foil capes as your reward?